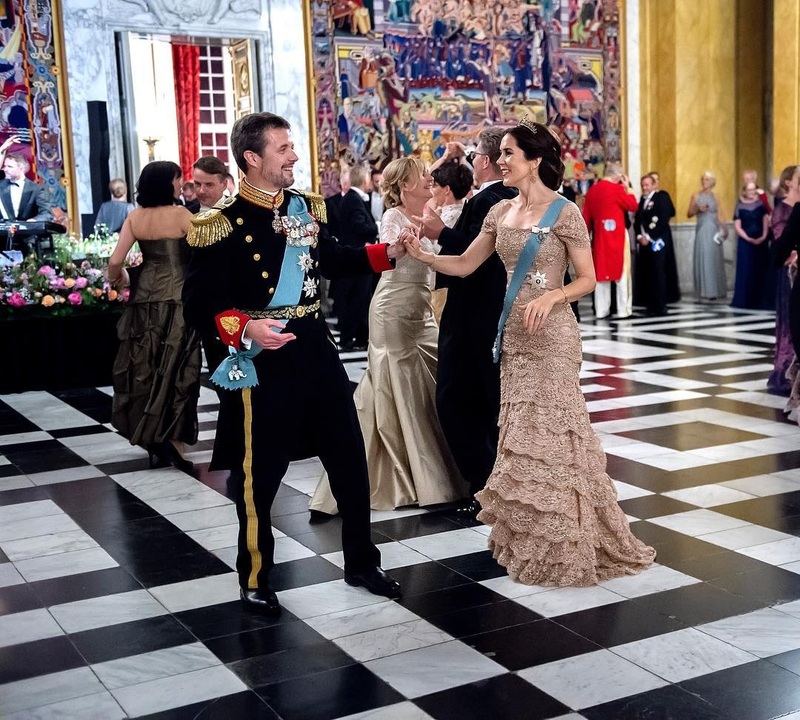 The Danish royal family doesn’t usually mess around when they label something a “gala” dinner, and they did not disappoint for Crown Prince Frederik’s 50th birthday banquet at Christiansborg Palace: tiaras all around! Plus, plenty of foreign royal guests to up the tiara count. A gift of sparkle for us all. This event could go down as one of my all-time favorites just based on the number of fringe tiaras alone. Even a fringe from Liechtenstein – not a country we usually see represented at big Danish gatherings – showed up: the Habsburg Fringe Tiara on Hereditary Princess Sophie. Countess Sussie of Rosenborg (not pictured) added a Danish fringe to the pile with Queen Alexandrine’s Fringe Tiara. 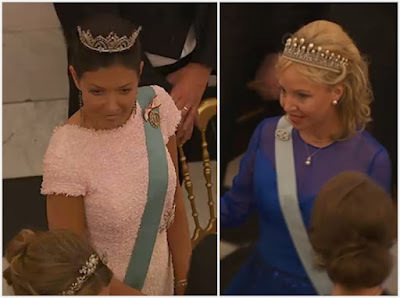 Crown Princess Victoria threw in the Baden Fringe Tiara, a nice contrast to her floral Camilla Thulin ballgown. The dress has been changed since we saw it at the King’s Dinner for Nobel laureates in December; it has sleeves now and I like them. 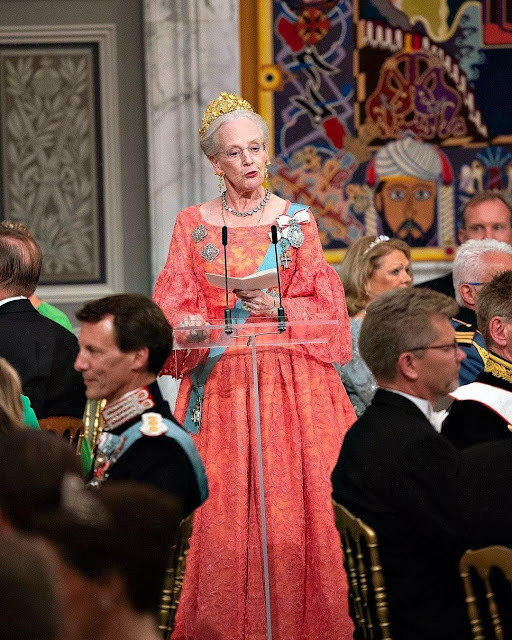 Much as I love a floral ballgown, my fringe queen of the evening has to be Princess Benedikte. The Sayn-Wittgenstein-Berleburg Fringe Tiara is large and in charge and the dress seals the deal. She’s regal in her sleep, I’m pretty sure, so add in the built-in cape at the back of this and she soars off the charts. Probably the most notable fringe appearance of the night comes from Princess Maria-Olympia, in her very first tiara appearance. She’s wearing the fringe we usually see on her mother, Princess Marie-Chantal, but the story is that it was destined for Olympia all along. She had the biggest tiara of her grouping, followed there by Princess Theodora in the Antique Corsage Tiara. What’s a mom to do when her daughter claims her tiara back? And when it’s not really a big gun occasion, leaving Queen Sophie’s Diamond Tiara off the table? 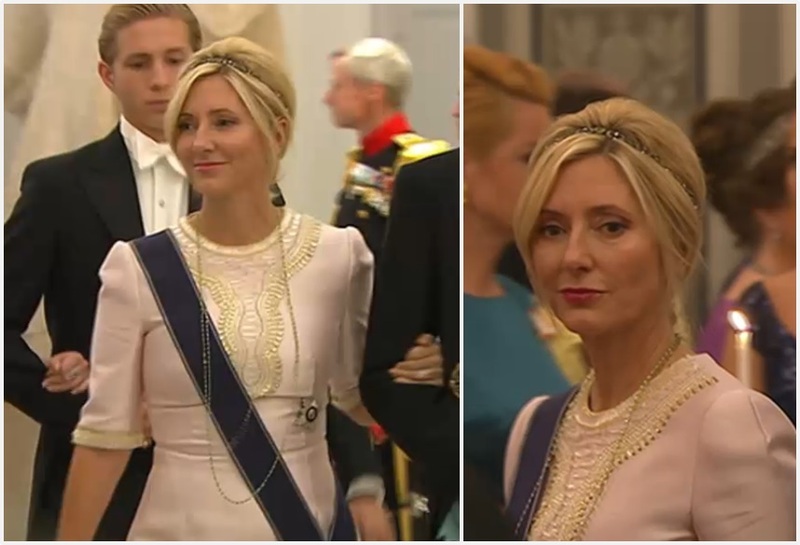 While I don’t normally approve of teensy headbands at big tiara occasions, it would be Princess Marie-Chantal that would make it work. This piece pairs really well with the delicate necklace and the hair works around it to make it more than a headband. ...all the interest was happening on her sleeve and we don’t really get to see it on the parade into the banquet because she’s arm in arm with King Philippe. According to ModeKoningin Mathilde, the dress is by Esmeralda Ammoun and that sleeve detail is art by Belgian artist Paula Raiglot. Let’s see it again another time. All of that leaves me to crown Grand Duchess Maria Teresa the ruler of the reds. Playing catch up to Queen Máxima’s red caftan from earlier in the week suits her well. And she finally gave us a different tiara – but only because this one was already out of the vault from the state banquet, let’s not get too crazy. She’s wearing the Chaumet Diamond and Pearl Choker Tiara with the pearls back on top. We don’t get to see these two tiaras that often, three cheers for any appearance at all: the Alexandrine Drop Tiara on the Countess of Frederiksborg and the Ancona Tiara on the Duchess of Castro. 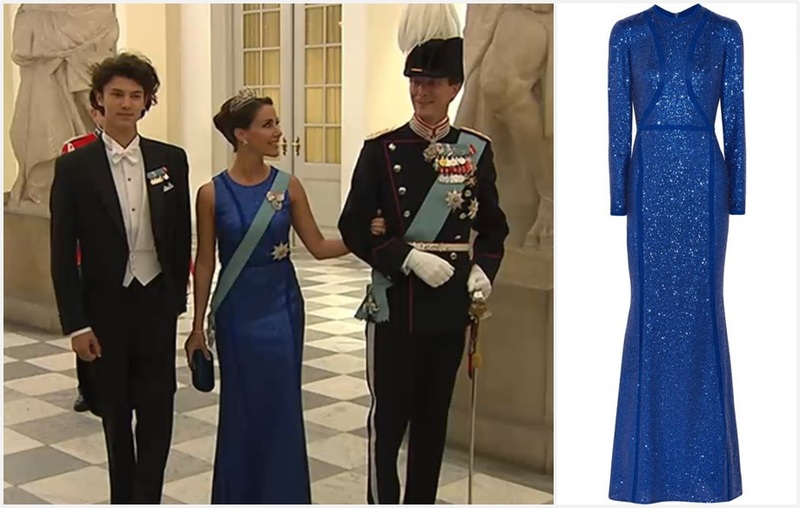 Several of you have noted that Queen Máxima’s purple dress from King Willem-Alexander’s 50th birthday celebrations had been borrowed back from the ongoing Jan Taminiau exhibition, and were anxiously awaiting its appearance. Did she pick the right event for it, though? The dress has so much going on that I actually hate to see the sash over top of any of it. The Dutch Diamond Bandeau was probably her safest tiara choice. Queen Margrethe had to plan ahead for the Naasut Tiara; it, along with Princess Benedikte’s Floral Tiara worn by Princess Alexandra of Sayn-Wittgenstein-Berleburg and the Khedive of Egypt Tiara worn by Queen Anne-Marie (neither pictured here) were on display in Koldinghus. And I can’t help but wonder…why? Looks-wise, I mean. That yellow gold doesn’t look its best with the settings on these diamonds. Oh well. It worked out alright with her new pink party dress. She still can’t resist a big sleeve, can she? Bless. This dress. 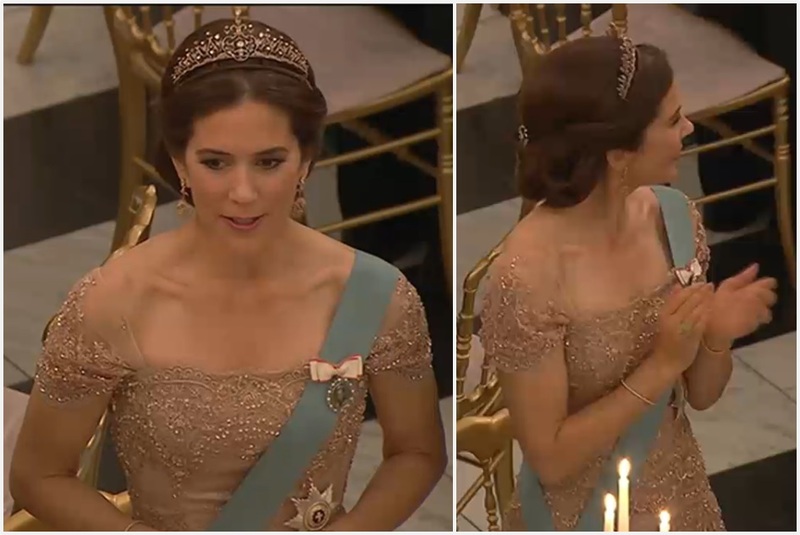 Crown Princess Mary's dress. Oh my. This is a piece of art by Lasse Spangenberg. Mary paired it perfectly with her Diamond, Ruby, and Spinel Necklace Tiara, the matching earrings, and even a brooch at the back of her hair. That brooch was a gift to her from the late Prince Henrik. Time to get out those future Best of 2018 lists and ink some things in, methinks. Do you spy any Best of 2018 prospects here? Who takes home your best dressed awards for the night?